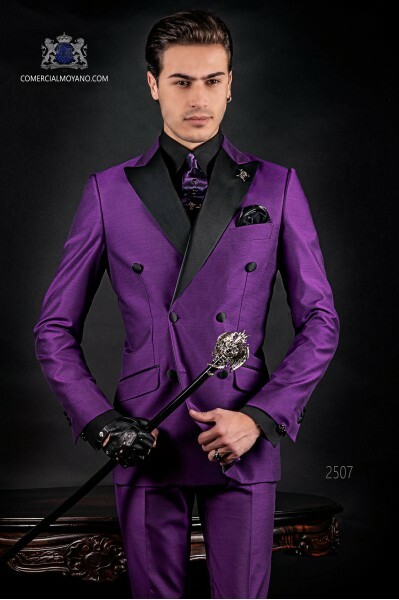 Colorful gothic suits There are 21 products. 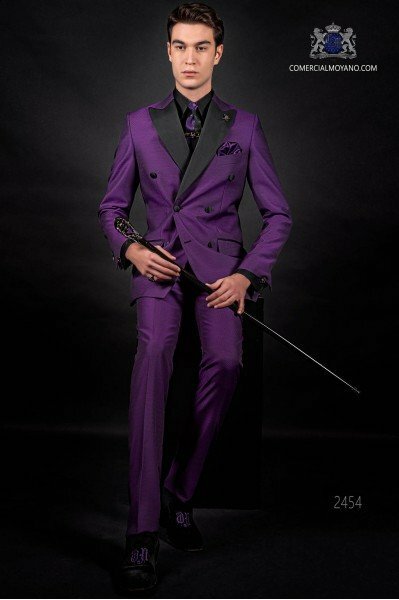 Italian fashion double breasted suit Slim fit. Satin peak lapels and 6 buttons. Shiny red Fabric. 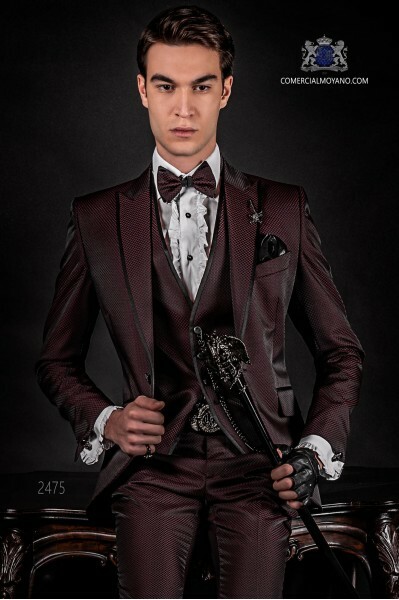 Burgundy fashion tuxedo wedding suit Emotion collection 2464 Ottavio Nuccio Gala. It comes with bag garment Ottavio Nuccio Gala. Italian fashion suit Slim modern cut. Exclusive style suit tuxedo with peak lapels and a button contrast, stylish breast pocket and slanted pockets with flaps tailoring. New maroon lurex fabric. 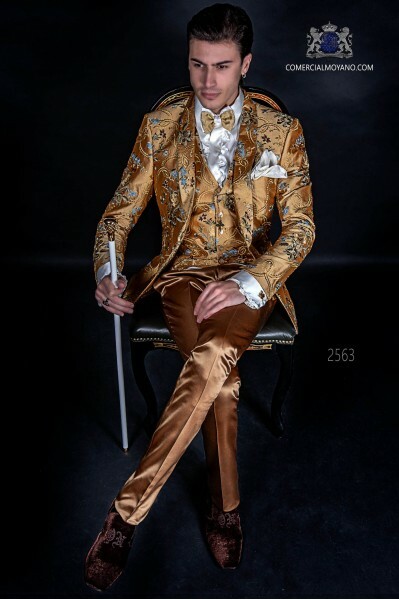 Fashion tuxedo wedding suit 2461 Emotion Collection Ottavio Nuccio Gala. Complete the outfit with bass vest in straight version 3 covered buttons to set the suit. Italian patchwork jacket made of pure jacquard silk red tones, 2 buttons. Pure silk fabric. 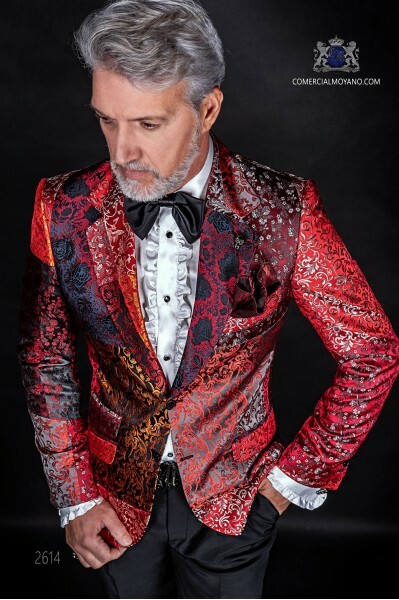 Patchwork jacket emotion collection 2614 Ottavio Nuccio Gala. 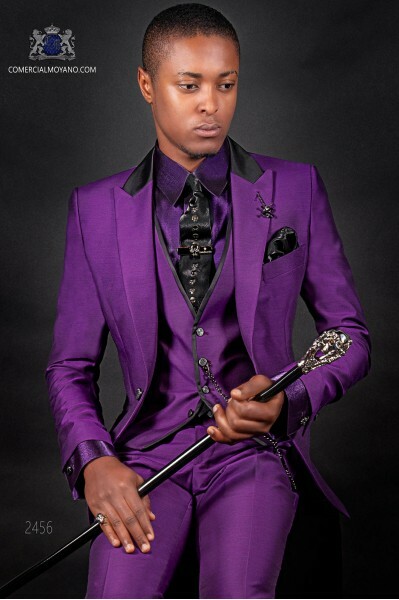 Italian purple tuxedo with contrast lapels. Jacket with black peak lapels and 1 covered button. Wool mix purple fabric. 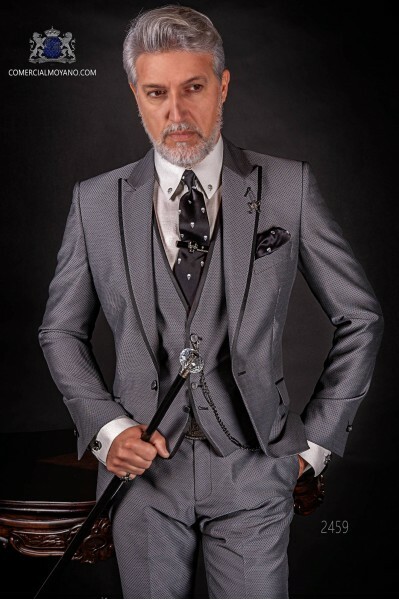 Tuxedo wedding suit 2556 Emotion Collection Ottavio Nuccio Gala. Black wool mix trousers and vest. 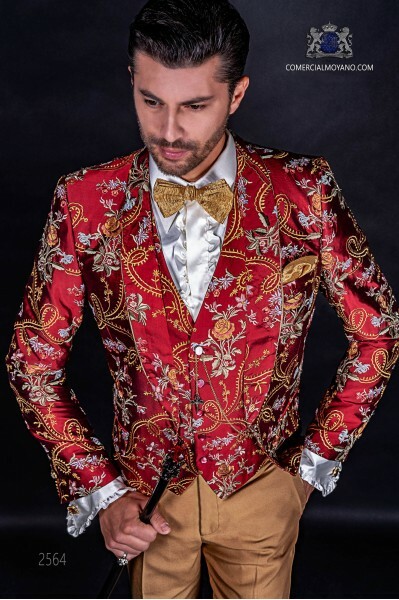 Italian red fashion suit in jacquard fabric with a special design with shawl collar and 1 button. Red jacquard special design silk mix fabric. 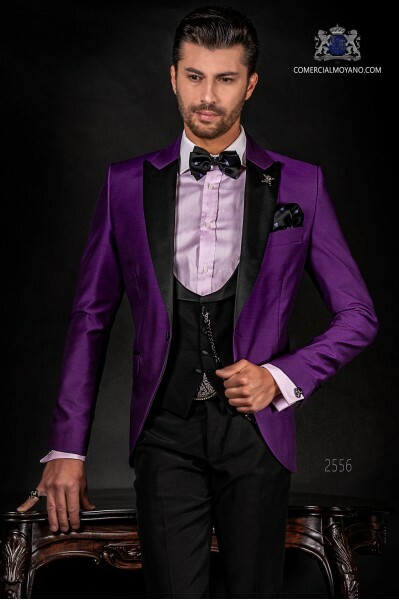 Tuxedo wedding suit 2564 Emotion Collection Ottavio Nuccio Gala. Italian "handmade" patchwork jacket made of pure jacquard silk gold tones, 1 buttons. Pure silk fabric. 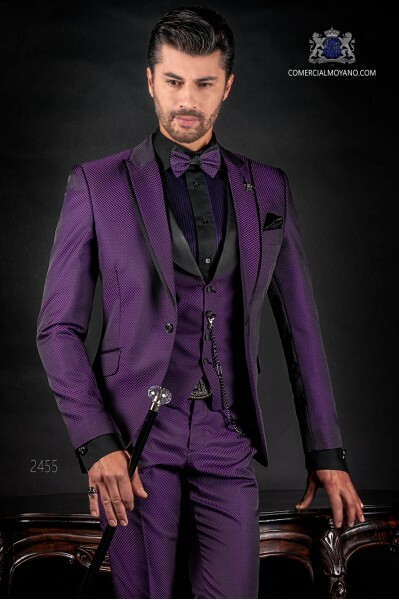 Patchwork tuxedo wedding suit emotion collection 2553 Ottavio Nuccio Gala. 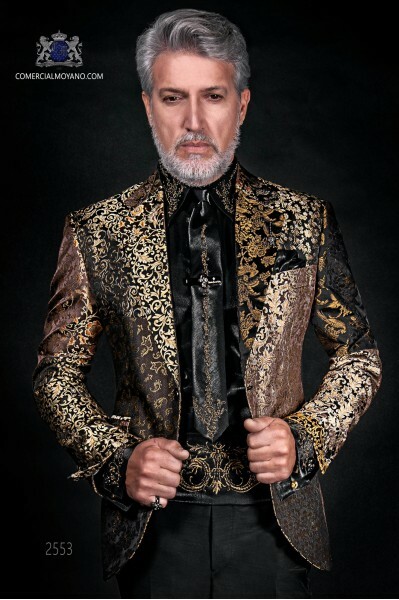 Italian fashion suit in jacquard fabric with a special design in golden tones, with shawl collar and 1 button. Jacquard special design silk mix fabric. 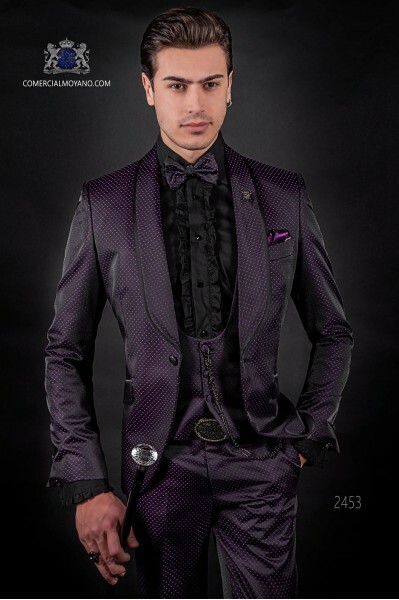 Tuxedo wedding suit 2563 Emotion Collection Ottavio Nuccio Gala. 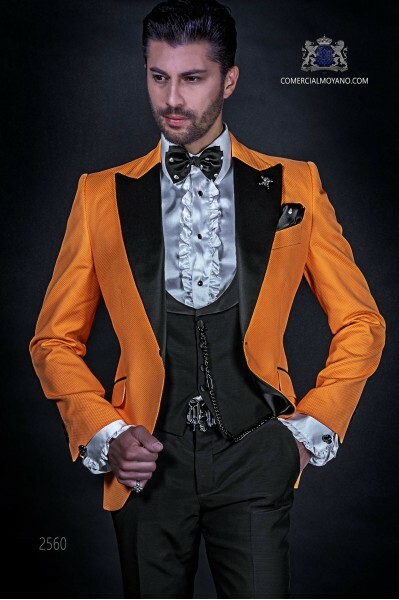 Tuxedo wedding suit orange cotton pique suit with black satin lapels with 1 button. Flap pockets. Combined with black trousers. style 2560 Ottavio Nuccio Gala, Emotion Collection. Italian fashion suit with modern slim fit. 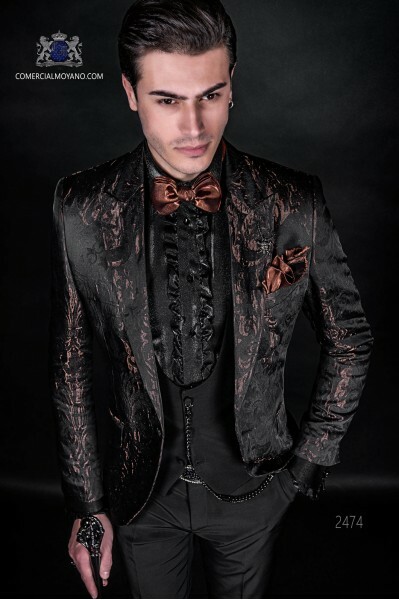 Model tipped black lapels in contrasting black and 1 button fantasy, breast pocket, pocket Match Girl and stylish tailoring with slanted pockets flaps. Rectal Vest 4 buttons on black fantasy and vivid contrast. New luxurious fabric performance "litmus" in red. 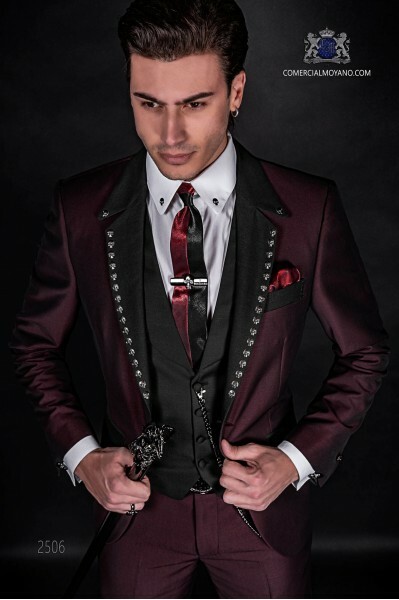 Italian fashion bespoke black and red polka dots suit with black peak lapels and 1 button. Wool mix fabric. Fashion suit 1959 Emotion Collection Ottavio Nuccio Gala. 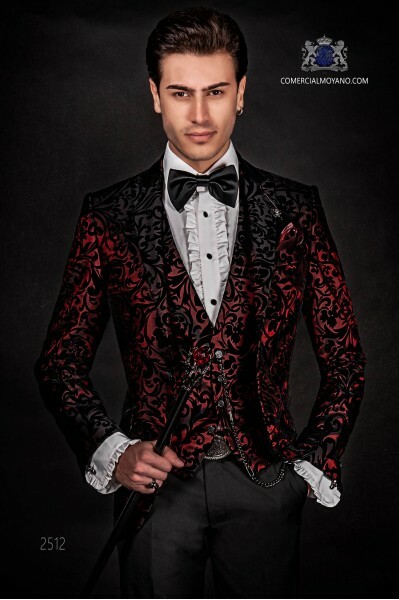 Complete the outfit with matching polka dots waistcoat with shawl collar and 4 covered buttons and red lurex tie and pocket square with skull black studs.